With Saunders Q & A Review Cards for the NCLEX-RN® Examination, 2nd Edition, you can study anytime and anywhere! 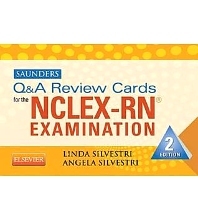 The ideal companion to Saunders Comprehensive Review for the NCLEX-RN Examination, Linda Silvestri’s review cards contain 1,200 practice questions — each including test-taking strategies and detailed rationales for both correct and incorrect answers. Practice questions, organized by clinical area, appear on the front of each card with an icon indicating client need. The reverse side shows answers and rationales, along with Silvestri’s unique test-taking strategies and priority nursing action tips. 1,200 practice questions include detailed rationales for both correct and incorrect answers. Alternate item format questions include multiple response, prioritizing, fill-in-the-blank, chart/exhibit, and figure/illustration to prepare you for the prioritizing, decision-making, and critical thinking skills needed to pass the NCLEX-RN. UNIQUE! Test-taking strategies for each question provide direction and hints to the correct answer. UNIQUE! Highlighted keywords or phrases in each answer identify a recommended review topic related to the question. Numerous pharmacology questions reflect the heavy emphasis on pharmacology on the NCLEX-RN.